Some institutions call it white-glove treatment, others call it concierge service and some refer to it as their red-carpet rollout. ­These are among the descriptions colleges and universities are using to attract the growing number of transitioning military students. As more aid has become available for college attendance through the Post-9/11 G.I. Bill, institutions are striving to compete for those prospects, estimated by the U.S. Department of Veterans Affairs to number 1.1 million. ­The bill covers 100 percent of a public, four-year undergraduate education to a veteran who has served three years on active duty since Sept. 11, 2001. One of the ways the schools compete is by attaining military-specific rankings and designations. One of those is Military Friendly, a trademarked term for the ratings division of a privately owned company, Victory Media, which rates higher education institutions, as well as businesses, based on their programs to recruit and retain military veterans. Victory Media and Military Friendly are not government entities. One of those is ­The Ohio State University (OSU), where 2,300 military-connected students are enrolled in the 65,000-student public institution. ­The Columbus-based university has earned the designation, as well as the distinction of being No. 1 on the CollegeFactual.com list of 100 Best Schools for Veterans. Jolene Jefferies, vice president for training and development with Military Friendly, says institutions with the designation run the gamut of higher education. “We work with Ivy League schools, public, private, for-profit and not-for-profit schools, and online schools. ­They all have a need and want to reach out and work with military students,” Jefferies tells Diverse. The Military Friendly official website explains how it determines the 1,400-plus institutions on its current list, stating that federal databases for higher education-employment outcomes “rely on total aggregated student body data in several key areas: student graduation rates, student placement rates, student loan default rates,” but the Military Friendly Schools program goes further. Jefferies says, “We request additional proprietary data to establish an institution’s effort specifically on behalf of military families and veterans. Through our list publication, we provide an alternative that we believe reflects a more accurate account of an institution’s Military Friendly status.” The company also shares best practices with institutions to help them improve their military recruiting and development programs. The successful Military Friendly schools build relationships with prospective military students “right from the beginning” and continue those relationships throughout the students’ matriculation, Jefferies explains. One of her recommendations is that institutions form a veteran services advisory board or task force that meets regularly to bring together college personnel, alumni and students. 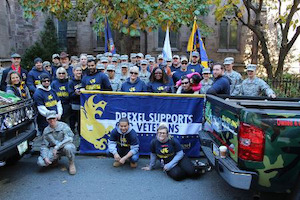 On Veterans Day in 2011, the school opened Drexel University Veterans Lounge, which has become a social gathering space and activity center for the military students. Other Military Friendly institutions are offering similar treatment to prospective students who are using VA or Department of Defense education benefits. At OSU, military students receive peer-to-peer sponsors, who help them navigate the sometimes challenging orientation process, inform them about available services, and check in with them on a weekly basis to see how things are going. “We have two goals — to build trust with our veterans and to let them know when you get here we want to get you to academic success,” Carrell, who is also a retired U.S. Air Force colonel, tells Diverse. At OSU, being Military Friendly has important benefits for students. Carrell points out in an online statement that military students are transitioning into college life in which most students may be much younger; they also face a transition back to civilian life; and many veterans are shifting from combat and operations, which can be the most difficult hurdle. Since 2013, OSU has partnered with the VA to have a VetSuccess On Campus counselor who works out of the university’s Office of Military and Veteran Services to coordinate the delivery of benefits and services to student veterans. Another tip on Jefferies’ list is to recognize the importance of military spouses. At Drexel, Weidensaul says the importance of family members is recognized when social activities, guest-speaker events, and forums are planned — making sure spouses and family members are invited to participate. Jefferies encourages institutions to develop strategic marketing campaigns that include traditional, digital and social media resources. As an example, she notes the University of Wisconsin–Superior’s Veteran and Nontraditional Student Center and its use of technology in its recruitment program. “The center starts building relationships [between] the admission staff and students right from the start, once center staff identifies potential military students using a really cool internal tracking tool to proactively reach out to those applicants to talk about their services and resources,” Jefferies says. The designation helps Hispanic-serving and historically Black institutions with their outreach as well. Alabama A&M University, a historically Black institution in Huntsville, Alabama, announced its Military Friendly status in 2014 on its website: “The distinction means that AAMU ‘is among the elite’ competing for military students.” California State University, San Marcos, a Hispanic-serving institution, announced its placement on the Military Friendly list in 2011, and recently stated it has had a 40 percent increase in the number of veterans, active-duty personnel and military dependents in the last three years. Ratings and rankings of best colleges for veterans and military students are compiled by various entities, including U.S. News & World Report, Military Times, CollegeFactual.com and BestColleges.com. Many of the Military Friendly schools are also on those listings.